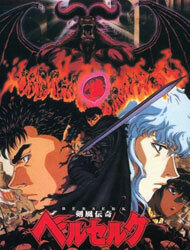 Plot Summary: A brave young warrior named Guts fights for his fortune as a mercenary on the front lines. A fated encounter unites Guts with the charismatic and deadly young man named Griffith. Leading the rogue soldiers known as the Band of the Hawk, Griffith wields his formidable force like no other. Driven by a quest for status, the Hawks exert military and social prowess the likes of which have never been seen before. The armies of Midland will quake with fear as Griffith and Guts set off on a path that will bring the world to its knees.